In March of this year, the Pew Research Center conducted a study on teenage technology use, and found that mobile access to the internet among teens is “pervasive.” According to the study, almost half of teens (47%) own a smartphone, and almost 1 in 4 (23%) own a tablet (which is comparable to the general adult population). Additionally, almost 3 in 4 teens (74%) say that they use mobile devices to check the internet at least occasionally, and 1 in 4 (25%) claim to be “cell-mostly” internet users. This apparent enthusiasm for mobile technologies, such as tablet devices, has not yet been matched by the institutions charged with educating teens—not in Colorado, at least. For the 2012-2013 school year, responses to the Colorado School Library Survey indicate that in Colorado’s public high schools, there is a median of less than one tablet (0.67) with access to library resources per 100 students. For more information about technology in Colorado school libraries, see our Fast Facts, Colorado School Libraries and the Use of Web Technologies, 2011-2012, as well as the 2012-2013 Colorado School Library Survey results. According to a Pew Research Center survey of more than 2,400 Advanced Placement and National Writing Project teachers, digital and web technologies are having beneficial and tangible impacts on student writing and skills needed for the future. When asked to rate the importance of various skills in contributing to their students’ success in life, the ability to judge the quality of information topped the list, with more than 9 out of 10 teachers calling it an “essential” skill for the future. School librarians are vital to building this skill, and the findings of our annual survey of Colorado public school libraries indicate that 60% of certified librarians help students evaluate the credibility of information and web resources at least once a week. Other skills deemed “essential” by a majority of teachers in the Pew survey include: behaving responsibly online, understanding online privacy issues, and finding information quickly. School librarians provide the foundation for such skills, by teaching students how to use digital resources, as well as how to use technology to organize and share information. Simply put, skills that teachers believe are important for the future are the same ones being taught by school librarians as part of everyday instruction. Find out more about what skills Colorado school librarians are teaching with our newly released 2012-13 Colorado School Library Survey results, available at http://www.lrs.org/school/data/. 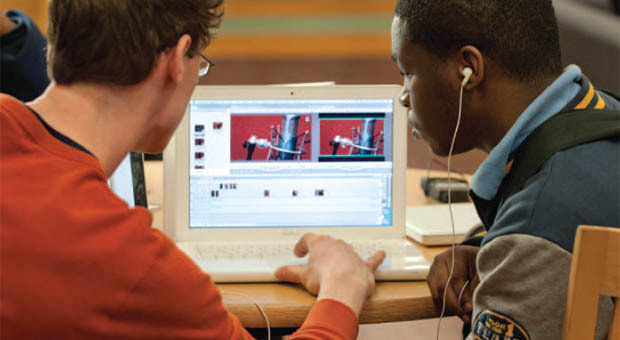 YOUmedia is a 21st-century learning space for teens located in 5 Chicago Public Library branches. It provides a place where teens can access and learn about digital media (photo and video editing, web design, podcasting, audio recording, etc. ), and collaborate with their peers and mentors in a supportive environment. The University of Chicago Consortium on Chicago School Research recently released the findings of a study they conducted of the impacts of YOUmedia on teen participants. A little more than half (57%) of the respondents reported that they improved their digital media skills (making a video, producing a podcast, creating a website, etc.) through their involvement in YOUmedia. In addition, more than half said that YOUmedia helped them with their schoolwork, and improved their writing skills and their communication with adults. Through an IMLS and MacArthur Foundation grant, learning labs inspired by YOUmedia will be created by 12 organizations (7 libraries and 5 museums) across the country. 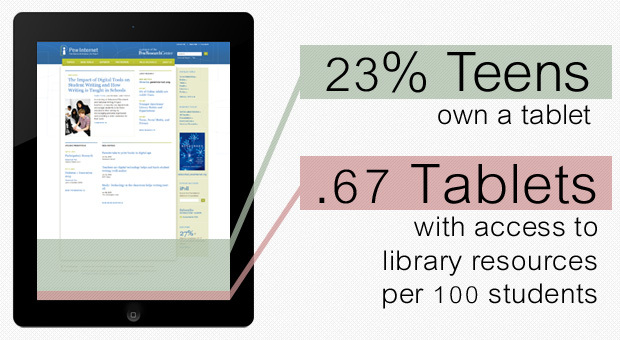 According to ALA’s 2013 State of America’s Libraries Report, 2012 was yet another tumultuous year for libraries in their quest to achieve fairness in e-book lending. ALA President Maureen Sullivan published an open letter to America’s publishers in September, requesting change, after Penguin (one of the “Big Six” publishers) denied libraries access to its titles, and others drastically increased their prices. 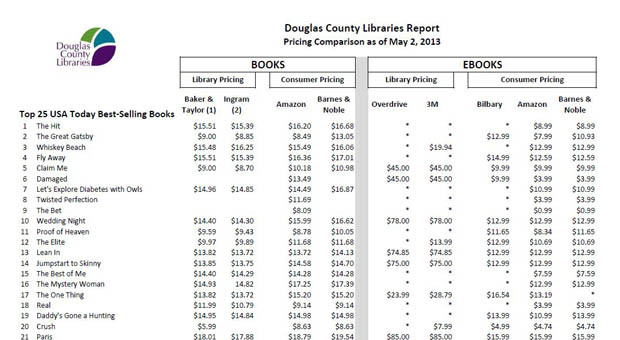 To provide more information about this issue, Douglas County Libraries has a series of monthly e-book price comparison reports. Their July 2013 report shows that libraries still have a long way to go in this quest, as they are paying up to 550% more for e-book bestsellers than consumers. The Pew Research Center’s newest stats from its Internet & American Life Library Services Survey dive into younger Americans’ (16-29 years old) library and reading habits and reveal an interesting blend of technology and traditional service expectations. 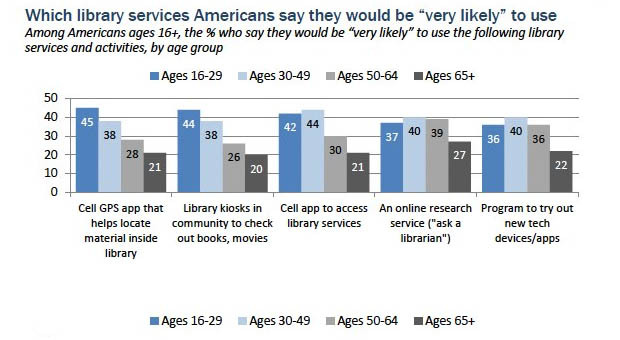 Perhaps most telling is that this group is significantly more likely to have either used technology at libraries or accessed online library services than adults older than 30. For example, 38% of younger Americans have used computers and the internet at libraries in the past year, compared with 22% of Americans ages 30 and older. Such tech-centric use is balanced by the younger generation’s ties to print media, as three-quarters say they have read at least one print book in the past year, well above the 64% of older adults. This mix of preferences extends to library services, with 3 out of 4 younger adults saying it’s very important for libraries to offer free access to computers and the internet as well as books for borrowing. For more on Americans’ reading habits over time, check out Pew’s interactive tool reporting stats by age group. “There’s always that joke that there’s a Starbucks on every corner,” says Justin Grimes, a statistician with the Institute of Museum and Library Services in Washington. “But when you really think about it, there’s a public library wherever you go, whether it’s in New York City or some place in rural Montana. Very few communities are not touched by a public library.” To prove this point, Grimes created a map indicating public library locations nationally. There are approximately 17,000 public library outlets, including library branches and bookmobiles, across the U.S., outnumbering McDonald’s locations (14,000) and Starbucks (11,000). According to IMLS, libraries reach 96% of the U.S. population, a number drawn from the 297.6 million people served by a public library. A recent study of parents, children, libraries, and reading found that four in five (79%) parents of minor children (under age 18) stated that libraries were very important for their children. This number rose even higher for parents with children under the age of 6: 84% of these parents described libraries as very important. Nearly every parent in this study (97%) stated that it is important for libraries to offer programming for children and teens. According to parents, some of the top uses of the library by children were: book borrowing, work on school work, attend a library event, and use the internet. Other reasons for use included attending a library-sponsored book club and to socialize with friends. 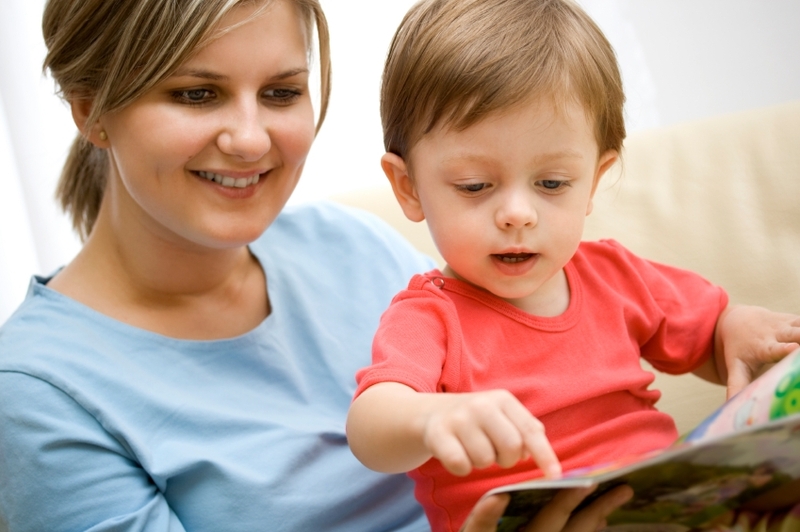 Additionally, parents of minor children are more likely to use library services than other adults. Parents attending the library with their children are also more likely to increase their own browsing, borrowing, and program attendance, as well as support innovation and advancement in the library. There are some library attendance differences among mothers and fathers, as well as some differences in use and opinion of the library among various economic backgrounds, however overall parents overwhelmingly agree that the library is an important place for their children. Recently, the Global Libraries Initiative of the Bill & Melinda Gates Foundation surveyed more than 3,000 library stakeholders to solicit ideas on the role and key attributes of a future library and how the foundation could help encourage those attributes. Respondents ranked trained librarians and visionary, effective leadership as the two most important features of a future library. 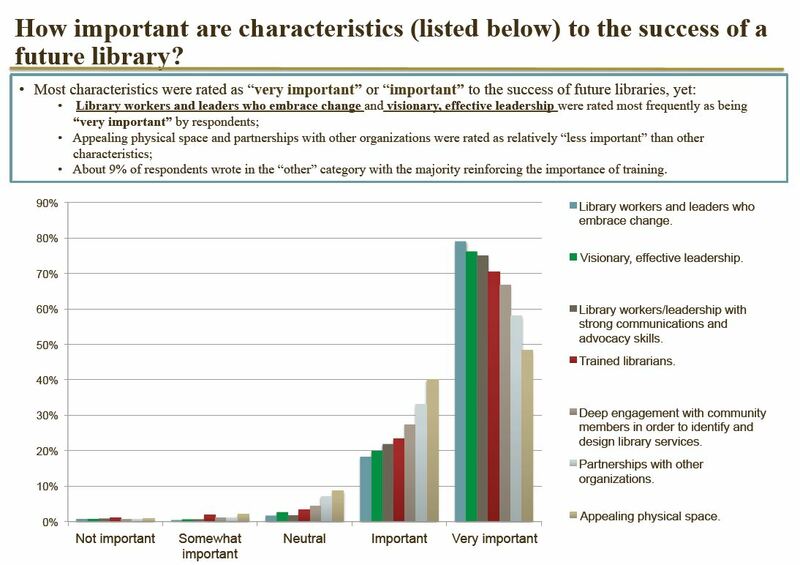 Characteristics deemed most important to the success of a future library included “library workers and leaders who embrace change” and “visionary, effective leadership.” Responses suggested the Gates Foundation should fund collaborative efforts among libraries and share results with the field in future support initiatives directed at public libraries. Find out more at WebJunction. School Library Journal recently surveyed more than 1,000 school and public librarians to pinpoint sources of job satisfaction and dissatisfaction within the field. For both school and public librarians, connecting young people to reading and lifelong learning rated first for offering satisfaction with their jobs. Working with young people and matching a child/teen with the perfect book took spots 2 and 3 for both public and school librarians. At the same time, both types of librarians face challenges in having time to get everything done. Budgetary constraints and balancing increased demand with fewer resources are also shared concerns. Find out more about national job satisfaction trends at http://www.slj.com/2013/05/research/sljs-2013-job-satisfaction-survey/. The BTOP buzz continues! Recently wrapped, the Broadband Technology Opportunities Program (BTOP) awarded more than $4 billion to 233 projects nationwide. ALA’s “U.S. Public Libraries and Broadband Technology Opportunities Program” report highlights state and local library BTOP projects across the country, which served about 20 percent of all U.S. public libraries. Nationally, programs funded by this initiative enhanced workforce centers and resources, broadband adoption, business development, community infrastructure, and digital literacy training opportunities. Colorado’s initiative focused on bridging the digital divide, and over the course of the 2-year grant period, more than 425,000 Coloradans increased their digital literacy skills by taking computer classes or receiving one-on-one instruction. Want more details? Our evaluation of Colorado’s program is discussed in our Closer Look and Fast Facts reports, as well as in several presentations. Note: This is the first post in our new series “The Weekly Number.” In this series, we will highlight statistics that help tell the story of the 21st century library.